Project Bookmark Canada is a one-of-a-kind, Canadian cultural innovation. Though many countries have tangible tributes to literature and writers, no other initiative in the world creates a permanent series of site-specific literary exhibits using text from imagined stories that take place in real locations. This Canadian literary trail is made possible by a network of generous volunteers, donors, partners and supporters — readers just like you. ﻿Project Bookmark Canada is a nationally registered charitable organization, CRA #82725 7569 RR0001. 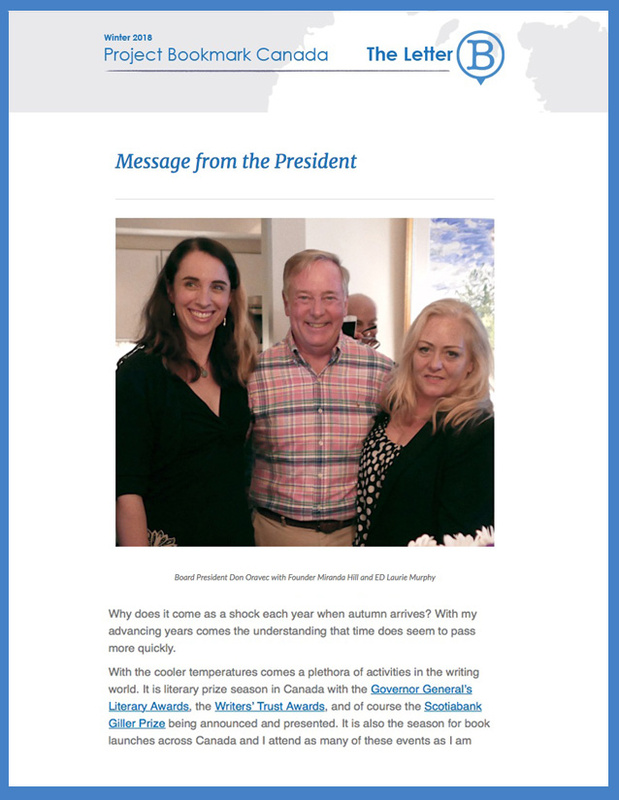 You can help build a Canadian literary trail from sea to sea to sea by making a donation to a particular Bookmark, or by making a donation to our organization overall. All financial donations of $50 or more receive a charitable tax receipt. You can make a suggestion for a Bookmark anywhere in the country by filling in our form. Bookmarks must be from a work of fiction or poetry, published in book form by a recognized publishing company or organization. While we acknowledge the literary value of works of non-fiction, Project Bookmark Canada celebrates imagined scenes in real places. Read the guidelines for sites & passages. There’s always a lot going on, on the Bookmark trail. Keep up with all the news, contests and call-outs here. What joy a tax receipt brings! Click to read the latest newsletter! Across the country, readers are getting together to do what they love — on Bookmark's behalf. Bookmark Reading Circles help build the database of potential passages from fiction and poetry and their corresponding settings so that they may be considered for future Bookmarks. The Circles can be created from existing book clubs, or can come together specifically for the purpose of suggesting potential Bookmarks. Bookmark Reading Circles may be organized to find potential Bookmarks for a geographic area (Hamilton-Brantford, for example); a genre (poetry, say or mysteries); or focused on a particular author's body of work (like, the stories of Alice Munro). The circles meet regularly to discuss possible Bookmarks (using our guidelines) and pass on their discoveries and suggestions to Bookmark through their group leaders. We love to profile our Bookmark Reading Circles in our newsletters and to encourage the trend to spread around the country. Get in touch today to start a Bookmark Reading Circle.